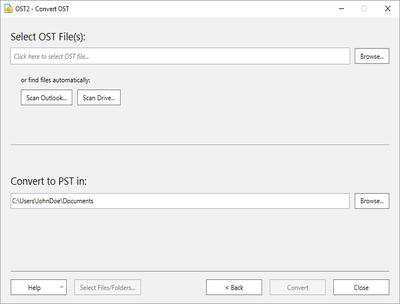 Learn how to convert OST to PST files using Free OST2 Converter software. Convert OST to PST file format and restore Exchange mailbox even after accidental Exchange user mailbox deletion. Open damaged, corrupted and inaccessible OST file and convert to PST file to recover Exchange mailbox folders easily. Back up the Exchange Server account mailbox by converting Outlook OST to PST format. Convert OST file automatically and have it backed up in the PST format at any moment. In case something happens to Exchange Server, you will be able to open all your precious data in Microsoft Outlook or migrate Exchange mailbox data to other system or service. OST2 converts ost files created with any version of Exchange and Outlook from 2002. Move data from Exchange to Outlook by transfering your files from OST to PST.